Wait! Before I confused more people, I was not in the city of Karaikudi in Sivaganga District in the Indian state of Tamil Nadu and the capital of the Chettinad region but instead I’m in an Indian restaurant in Penang’s Little India by the name of Karaikudi right in the heart of Georgetown, Penang. Thanks to PenangTuaPui for inviting me to try out their food. The food in this restaurant is so much different compared to a few others that I had frequent quite regularly. Here, they concentrate more on the fresh ingredients and spices imported all the way from India. That’s the reason why the taste, the texture and the fragrance emitted for the dishes were so pleasant to my senses. To get everyone’s appetite moving, we were first served with Mango Lassi (RM4.00) to hydrate and refresh the body after a tiring day. What could be greater than blending fresh mangoes and yogurt to rejuvenate the body? Not only does the beverage contain Vitamin A, B6&B12, C and many more nutrients, it has the necessary dietary fiber to aid our digestive systems. 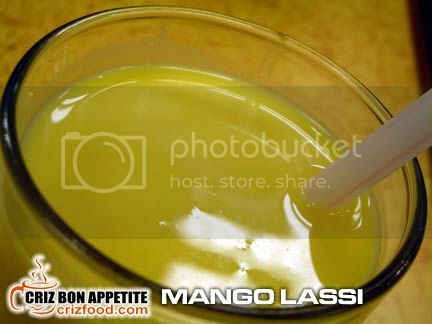 The Mango Lassi served here was one of the best I have tasted. It was thick, creamy and smooth flowing. How I wished they would blend in some ice cubes to make the beverage maintained its chillness. 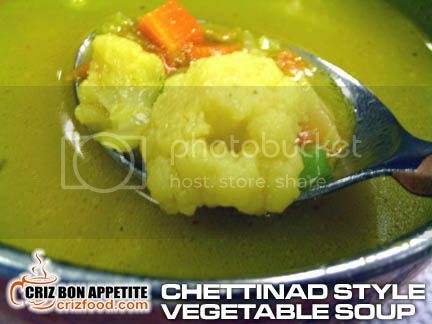 Chettinad Style Vegetable Soup (RM3.00) was served to every individual next. The soup was mild in taste with cuts of fresh cauliflower, carrot, French bean and dhal with a light touch of spices. The soup was light and slightly salted to boost up the pungent taste. Non spicy at all and it would be suitable even for kids. As appetizer, we were served with some thinly sliced and yet crunchy Bitter Gourd Chips (RM6.00). These were well marinated with chili powder, salt and chickpea flour (Besan) and deep fried to perfection. I love the version here as each piece was sliced so evenly thin and fried without any moisture left within. 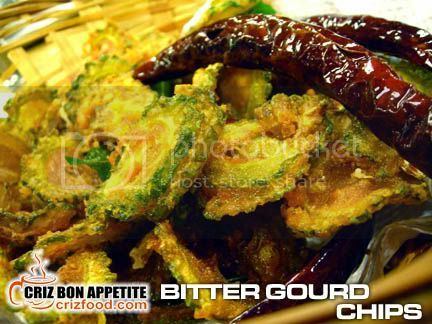 Moreover, having curry leaves and dried chillies fried together with the bitter gourd had added that special fragrance for the dish. Bitter gourd is also believed to improve the energy level, stamina, eyesight and also to lower sugar level in the blood and urine. This would be a great vegetable dish for diabetics. 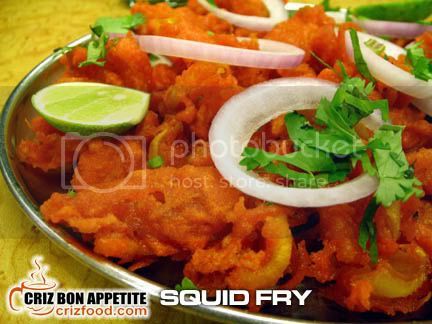 The next dish which is quite common in an Indian restaurant would be the Squid Fry (RM8.00). Slices of squids would be dipped in spicy batter and then deep fried while maintaining the tenderness within while having a crunchy outer layer of batter. It’s better to consume this dish as soon as it had been laid on the table as time would eventually make the fried squids soggy due to the moisture inside. No meal in an Indian restaurant would be complete without trying out their Chicken Briyani (RM9.50). Basmati Rice was use in this dish combined with the necessary spices and it has that hidden tangy taste of tomatoes. A chicken drumstick was hidden right at the base of the fragrant rice with a hardboiled egg above. The rice would go well with the accompanied side dressing such as chutney and raita but I personally felt that the chicken should be above. Somehow, the meat had lost its value hidden under the rice although this would be how any Indian restaurant would serve their Nasi Briyani. Moreover, the meat was not as fragrantly cooked as it should be. Another thing that the restaurant might not be aware of was the presentation. The modern generation might not be so concern about it as it would just be another meal to them. To the older generation, especially the Chinese Taoist, the hidden chicken especially in such a small bowl with an egg on top would meant something taboo which would only be performed in certain rituals. My advice to the restaurant would be to turn it into a clay pot style or present it on a plate. 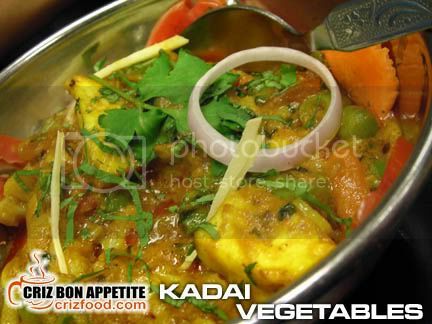 If you want something with rich gravy to go with your rice, you should order their Kadai Vegetables (RM9.00). There were assorted vegetables such as green peas, tomatoes, carrots and many more, slowly simmered with freshly grinded spices and water until the gravy became thick. This dish was really good as I can taste the freshness of the ingredients very well such as a touch of garam masala, turmeric, coriander, cumin, etc. The only difference in terms of style of cooking was the added bean curd cubes. Moreover, the freshly sliced coriander and onions garnishing gave that extra fragrance to the dish. 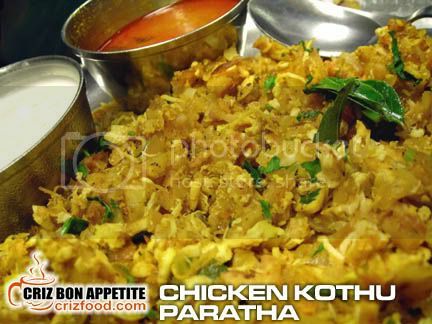 The Chicken Kothu Paratha (RM9.00) was something unique. Roti Paratha would be what the Malaysian would address as Roti Canai. It’s made of whole-wheat flour, pan fried in cooking oil or sometimes in ghee for the extra crispiness. The Roti Paratha would be cut into strips (somewhat the thickness of koay teow). On the other hand, the chicken meat would be cooked in curry and then hand shredded into smaller pieces. These would then be stir fried with boiled lentil (urad normally would be used in the cooking of dhal), eggs, tomatoes, onions, spices and curry leaves. This is a great dish and was not that oily too. When I saw the Ladies Finger Pepper Fry (RM7.00) on our little “test paper”, I thought it would be those slimy wet version of ladies fingers as the Chinese would cook. 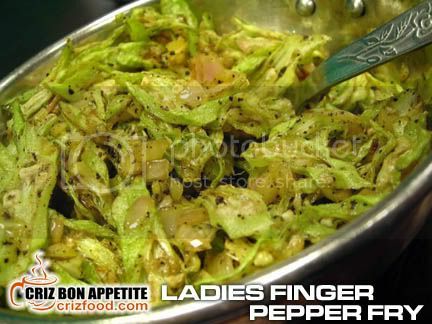 To my surprise, the dish came with deep fried thinly slices ladies fingers fried with chopped onion, grinded black pepper with some salt. It was so simply and yet it was so delicious with that peppery taste. In fact, we had ordered for a second helping. 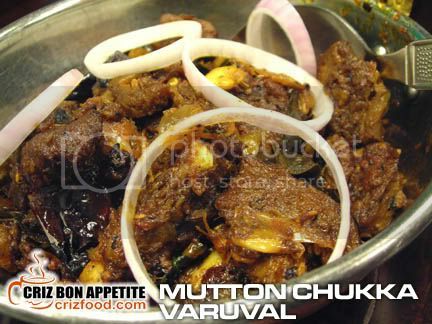 The Mutton Chukka Varuval (RM18.00) caught most of us by surprise with its powerful spiciness. Simple as it may look, the added curry leaves and chillies sent many seeking for more drinks. I suspected that the garam masala that they had used contained more grounded peppercorns than usual. I had no problem with that as spicy food regardless of Indian, Malay, Chinese or Thai has been quite a norm in my daily meals. Surprisingly, I found this dish to be extremely delicious. The meat just melted in my mouth as it was tender, juicy minus the strong mutton taste. The Kashmiri Naan (RM6.00) served here is simple but yet delicious. Normally it would be filled with more nuts and dried fruits such as raisins, pistachios, almonds, cashew nuts, shredded coconuts and many more. Instead of making the naan so complicated in ingredients, the restaurant made it simple by only filling it with desiccated multi colored coconuts some powdered cashew nuts and garnish with some chopped cherries. It was slightly sweetened but it was good as each bite was smooth to the mouth. 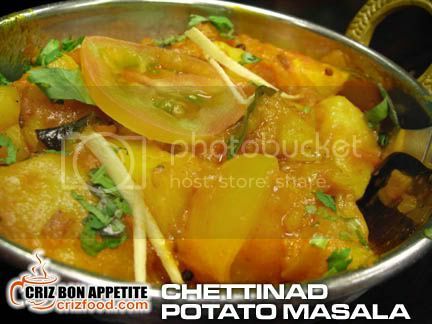 The next dish which was the Chettinad Potato Masala (RM6.00) has been my favorite no matter which Indian restaurant I had patronized. The only difference was that the ones served here was richer in taste. It was a perfect dish with potato cubes being sauteed fragrantly with the presence of cinnamon, star anise, cardamom, poppy seed, dried chillies, curry leaves, tomato and garnished with some coriander. The chef sure knew the secret to a good Chettinad masala. 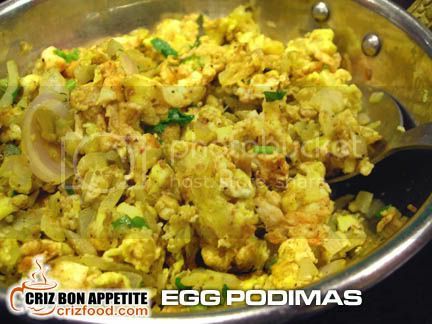 The Egg Podimas (RM4.00) was actually the Indian version of scrambled eggs. I cook this dish quite often at home but not as spicy as what the restaurant served. It’s basically beaten eggs fried with onions, chili powder (prapika), turmeric powder, coriander leaves, green chillies, mustard seed, curry leaves, salt and pepper. I normally add in slices of fresh tomatoes to cut down on the spiciness. 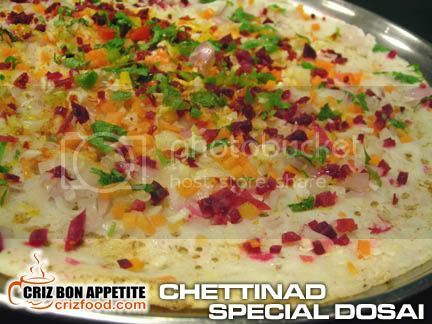 Chettinad Special Dosai (RM4.00) was indeed the colorful version of a plain Dosai. It had a generous spread of chopped beet roots, onions, carrots, cabbage, coriander leaves. 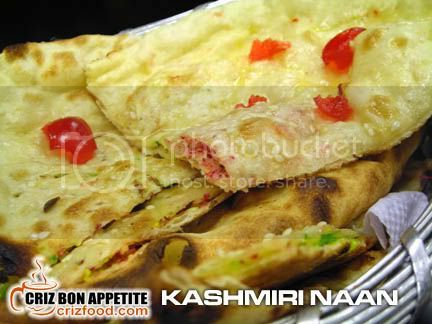 This crispy thin Indian pancake tasted well with the accompanied chutney and tomato puree. There was a surprise in store for us towards the end of the meal and it was the special creation of the owner’s wife. 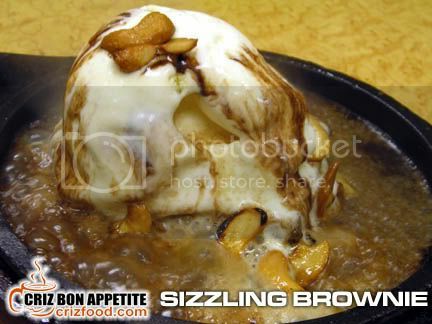 Sizzling Brownie (RM10) as the name stated came sizzling with a freshly baked chocolate brownie on a hot plate of melted butter, topped with a scoop of Vanilla ice cream, chocolate fudge and some cashew nuts. This was somewhat like the apple crumble I had at Swensen’s but the ice cream here melted just too fast over here. Although the dessert tasted great with the slightly burn taste of the brownie and cashew nuts combined with the saltiness from the boiling butter, I would advise the restaurant to reconsider the brand of the ice cream. This brand does not really suit the sizzling plate concept. It’s either the suggestion mention or to provide a thicker cake base to distance the sizzling heat from the ice cream. Moreover, the presentation was not as impressive as it should be as you can see on the photo below. It would be better if the sauce would be poured right in front of the customer for that wonderful experience, with the advance provision of a napkin of course. After a hefty meal, what would be best than to have a hot cup of frothy “teh tarik” styled in-house specially filtered brew, namely the Chettinad Filter Coffee (RM2.80) just like what everyone in Tamil Nadu would do. The distinct taste of the grounded roasted coffee beans, set in boiling water, filtered, then slightly sugared and with added fresh cow milk was indeed bonus for all. Alternatively, if you would love to have tea instead, you could always try out their spicy Masala Tea (RM3.00) or sometimes known as Masala Chai which has a strong taste of cloves, star anise, ginger, cinnamon and cardamom. There are many variants to the Masala Tea as sometimes ingredients such as grounded peppercorn, mint leaves, nutmeg or licorice roots would be added too. Some might not like their tea to be so spicy but it was surely an aromatic experience for all of us. If you are coming from Lebuh Light (Esplanade/Fort Cornwallis), you would reach a roundabout near Queen Victoria Memorial Clock Tower with one of Penang’s beautiful stainless steel structure known as “Pinang Dibelah Dua”. Turn 3 o’clock into Lebuh Pantai where all the main banks are. Drive on and keep a lookout for the 5th junction on your right (1st-Lebuh Union, 2nd-Lebuh Bishop, 3rd-Lebuh Gereja, 4th-Lebuh Cina and 5th-Lebuh Pasar). Turn right into Lebuh Pasar (Market Street) and you will see the restaurant on your right. Parking space could be quite limited here during certain peak period and office hours. Try to find some along Lebuh Penang, Lebuh King or Lebuh Queen. If you are having trouble finding parking space, I would advice you to park your car at Sri Weld Car Park (next to Sri Weld Food Court) located along Jalan Pantai directly opposite Lebuh Bishop and walk up to the restaurant. 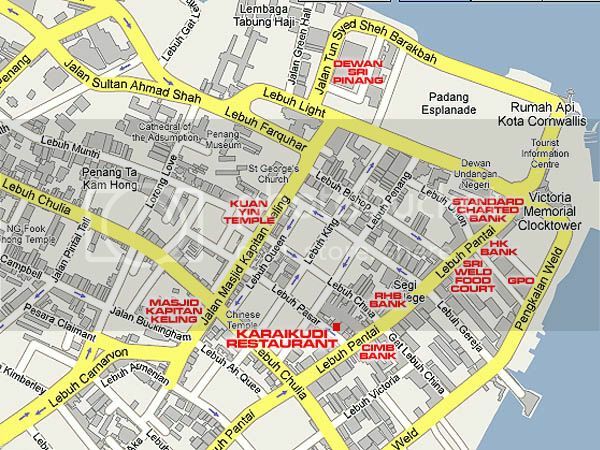 Address: 20 Lebuh Pasar (Market Street), 10200 Penang, Malaysia. Plentiful of nice Penang Accommodation are also available if you plan to visit Penang for all the wonderful and multinational cuisine. chicken cutlet looks so good! I am sure it goes well with the set meal. Food looks delicious…. the fragrance must be wonderful…. It was indeed a great experience Selby. Well… I won’t say it was a problem. It’s just that certain people would not be accustomed to their taste of the beverage. Gosh… I must, I repeat, I MUST make a visit there some day! Thanks for the rec. I do agree with you that the lassi is one of the best but if can chill up the coldness is even better. 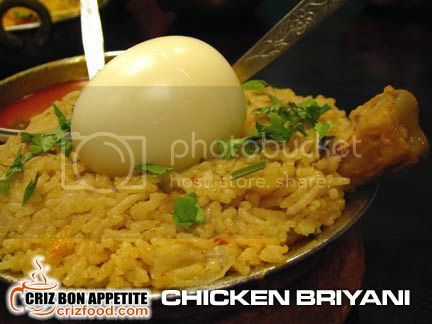 As for the Chicken Briyani I think there is still room for improvement on the chicken side. Even I am not that traditional type of chinese that is very particular on the out look but the taste of the chicken really need to look into it. 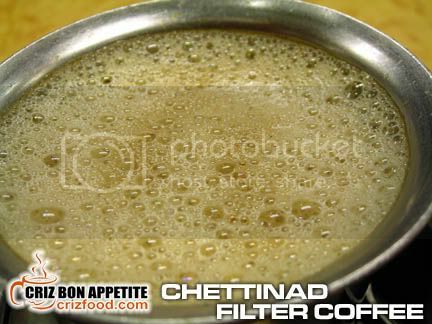 For the Chettinad Filter Coffee compare to Masala Tea, I still love the Coffee, sorry for the non-coffee lover. I think it is mainly because the powder of spices that mix in the tea that makes the tea “powdery”. Is not my cup of tea. Haha.. your cup of tea? It sounded real familiar. Where have I heard this before? LOL! 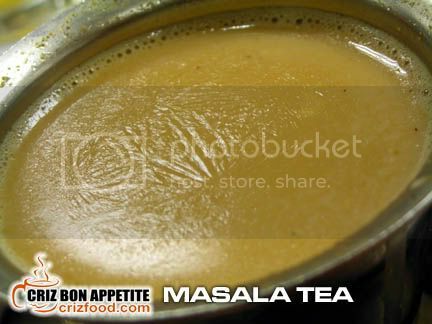 the masala tea is not that strong compared to those served in the country of origin!